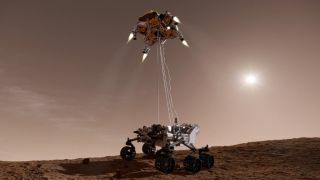 Artist's illustration of NASA's Mars rover Curiosity touching down via the help of a rocket-powered sky crane. Landing on Mars — as NASA's Viking 1 spacecraft did 40 years ago, on July 20, 1976 — is a complex affair. For example, the Red Planet is so far away that any landing sequences cannot be controlled in real time from Earth. Touchdowns must therefore occur automatically, requiring spacecraft to have a smart computer on board. The first spacecraft to reach the Red Planet was Mars 2, but it didn't survive the landing. The Soviet probe hit the surface of Mars hard on Nov. 27, 1971 and did not respond to repeated attempts to hail it. A follow-up mission with the same design, Mars 3, landed successfully on Dec. 2, 1971. Mars 3 sent a signal from the surface, but communications halted abruptly and nobody heard from it again. The Mars 2 and Mars 3 landers both separated from their orbiting spacecraft at about 28,580 miles (46,000 kilometers) from Mars, according to V.G. Perminov's "The Difficult Road to Mars: A Brief History of Mars Exploration in the Soviet Union," which is available on the NASA website. After entering the Martian atmosphere, the landers deployed an auxiliary parachute to slow down, then employed a main parachute. The design called for a soft-landing engine to be turned on at 52 feet to 98 feet (16 to 30 meters) above the Martian surface. The landers would then be severed from the parachute when their descent speed dropped below 14 mph (23 km/h). The landers were supposed to hit the surface at less than 27 mph (43 km/h); a "displacement bag" beneath them would absorb some of the shock. The aeroshell cover over the landers would be jettisoned after hitting the surface using compressed air inside the displacement bag. Viking 1 was the first NASA craft to make it to the surface of Mars, and its sister Viking 2 followed suit 6 weeks later, on Sept. 3, 1976. The Viking landers both launched with an orbiter. These spacecraft were very successful, transmitting a variety of data back to Earth until the Viking 1 lander died in November 1982. The design for Viking 1 and 2 called for the landers to separate from their orbiter mates. About 4 miles (6 km) above the surface, the Vikings deployed a parachute and jettisoned their protective aeroshells. Powered rocket landings were also used for NASA's (unsuccessful) Mars Polar Lander mission in 1999, and the agency's Phoenix polar lander in 2008. In June 1995, NASA engineers tested multi-lobed air bags designed to protect the Mars Pathfinder spacecraft during its Red Planet landing. The airbag landing method has been used for multiple Mars missions, mostly by NASA. Below is a sample sequence from the Mars Exploration Rover (Spirit and Opportunity) mission design, as described by NASA. This technique was sometimes referred to as "six minutes of terror." After cruising to Mars in a protective shield, the rover separated to head to the surface. It entered the Martian atmosphere and deployed its parachute four minutes later, when it was 30,000 feet (9,100 m) above the surface and travelling at 1,000 mph (1,600 km/h). Next, the craft jettisoned its heat shield, and the lander separated from the back shell, while still attached to the back shell (and parachute) with a tether. At about 8,000 feet (2,400 m) above the surface, the landing system calculated when to fire retro-rockets to almost stop the descent. Next, airbags would inflate to cushion the spacecraft. At about 40 feet (12 m) above the surface, the landing speed would be nearly zero. The airbag-shrouded lander was then cut from the back shell and parachute to bounce on the surface, until it rolled to a stop. Airbags were first pioneered with NASA's Pathfinder mission, which landed on Mars with its rover Sojourner in 1996. The method was so successful that it was used for the Spirit and Opportunity rovers, which landed on Mars in 2004. Spirit died in a sand trap in 2010, while Opportunity is still operating today. Opportunity has traveled farther than any other vehicle on the surface of another world, racking up more than a marathon's worth of miles on its odometer. Airbags were also used for the European Space Agency's Beagle 2 lander, which touched down in December 2003 but did not return any science data from the surface, and Russia's Mars 96 mission, which failed during its 1996 launch. NASA had to devise a new landing method for its car-size Curiosity rover, which weighed 1 ton here on Earth — far more than any previous Red Planet surface craft. So agency engineers came up with the "sky crane" strategy, also known as "seven minutes of terror." Like Martian landers before it, Curiosity used a parachute to slow down its descent after hitting the Martian atmosphere. The parachute was about 10 percent larger than Spirit and Opportunity's parachutes, because Curiosity is so much heavier. After the parachute slowed Curiosity down, the rocket-powered descent stage (sky crane) separated from the backshell. Four engines on the descent stage further slowed the descent while a tether lowered the rover to the ground. When the computer sensed the rover had achieved touchdown, it cut the tether. The sky crane then flew off and crash-landed on the surface a safe distance away. This incredibly complex maneuver worked perfectly during Curiosity's highly anticipated August 2012 touchdown. So NASA will use a similar design for its upcoming Mars 2020 rover, which should reach the Red Planet's surface in 2021. A brief summary of the sequence is available on the NASA website. While penetrators haven't been successfully demonstrated on Mars yet, they are a method for smaller and less delicate spacecraft to hit the surface and burrow inside. Penetrators were carried on the Russian Mars 96 mission and NASA's Mars Polar Lander (MPL) mission, neither of which made it safely to the Red Planet's surface. On MPL, the penetrators were together called Deep Space 2 and nicknamed Scott and Amundsen, after famous explorers of Earth's polar regions. According to NASA, the penetrators were supposed to separate from MPL during the landing sequence and impact the surface at 357 mph to 447 mph (575 to 719 km/h). A protective shell would shatter upon landing, and the probes would burrow up to 3.3 feet (1 m) below the surface. The probes never communicated with NASA, for reasons that remain unknown.